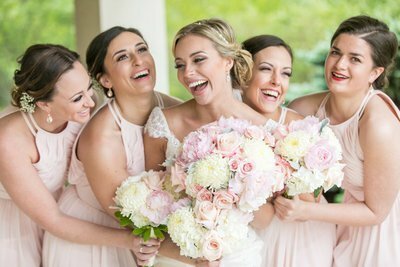 Erin sat calmly in her childhood home, as the final touches of her makeup was applied, and her bridesmaids surrounded her with bursts of laughter, recollections of stories from days past, and exclamations over the amazing weather Mother Nature had brought for us. 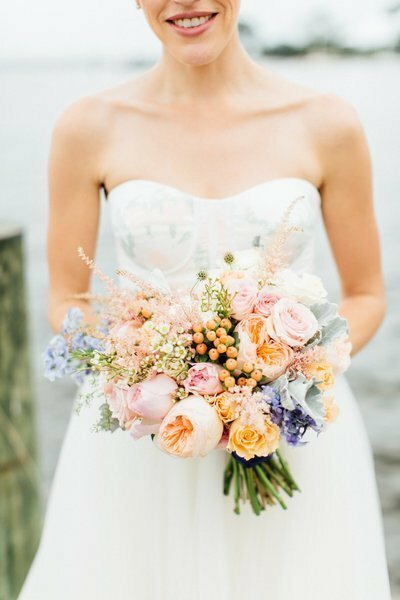 She was more than ready to marry her best friend, and for their Annapolis Maritime Museum wedding reception. 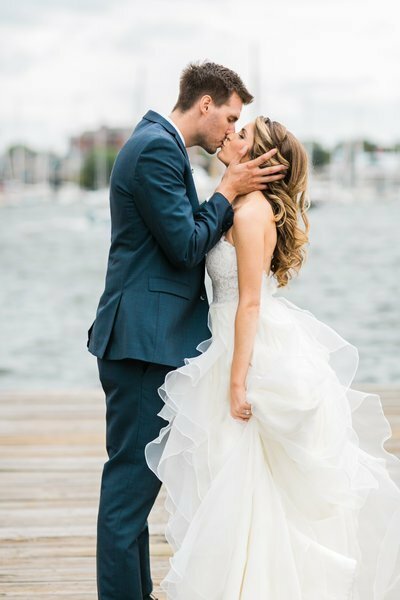 After slipping into her Watters wedding gown and simple elegant sandals, and a tender moment with her dad, we headed down to the neighborhood freshwater pond and pier for some photos. Erin glowed with excitement, and we managed to get a few photos despite the thrashing around of the strong waterfront breeze. Then it was on to St. Mary’s Church in Annapolis for their wedding ceremony. 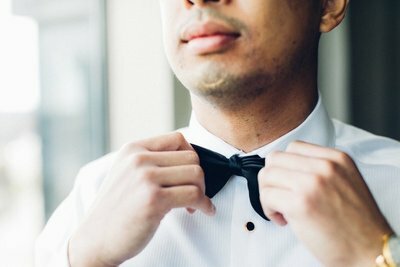 When Clark got his first glance of his beautiful bride coming down the aisle, he visibly and audibly let out an emotional breath of a moment he had been anticipating ever since he got down on one knee in the home that they shared together. Vowing to love and care for each other til the end of their days, Erin+Clark were pronounced husband and wife. 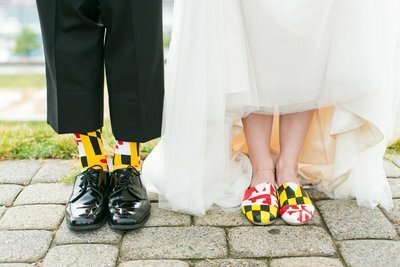 Guests were invited to join the couple at the Annapolis Maritime Museum, which is one of my favorite hidden gems in Annapolis! 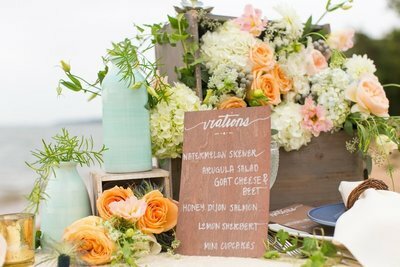 Since Erin grew up sailing, the venue really worked for them! Ken’s Creative Kitchen put out some beautiful and delicious dishes, and I overheard guests raving about their meal! Snackbar Jones played often at their college (Washington&Lee), so it meant a lot to have them play at their wedding and they totally rocked this reception’s dance floor! I left grinning ear to ear and still jamming out to their rendition of “Blurred Lines!” The bridal party left the wedding via water taxi, and the party kept on rolling with the after-party in downtown Annapolis. 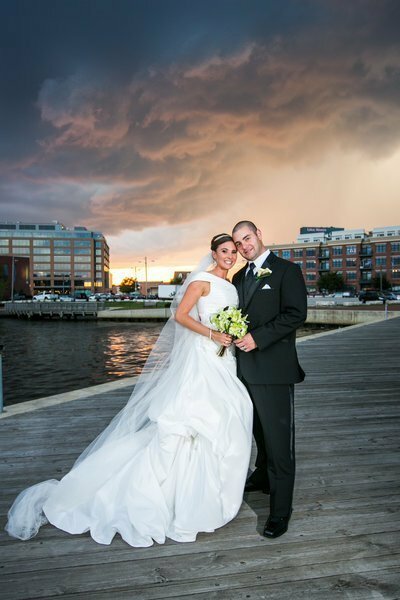 Erin+Clark – I’m beyond honored to have been chosen to capture the moments that made up your Annapolis Maritime museum wedding day. 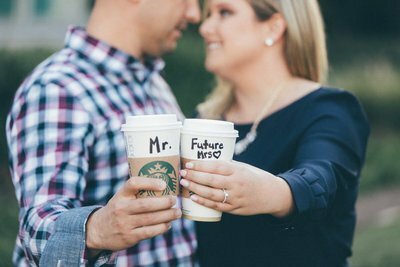 Wishing you two a lifetime of love & happiness – Congrats!! And a big thanks to my second shooter, Jamie, for helping me to capture the moments! Cake :: done by her mom’s cousin, Barb! Florist :: mom’s neighbor, Elizabeth! 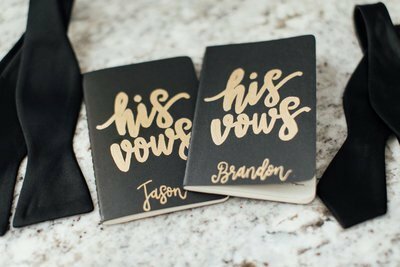 Lovely wedding, gorgeous couple – this should be published! Great attention to detail and I really love the portraits on the docks!! Beautiful!! Wow!! 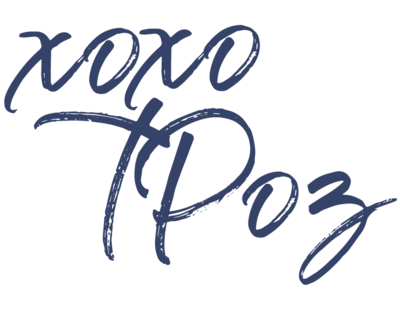 This wedding is stunning and that church – WOW!! Great job capturing it so beautifully. Teri! You’ve done it again! What a beautifully captured wedding. It looks like their day was perfect. 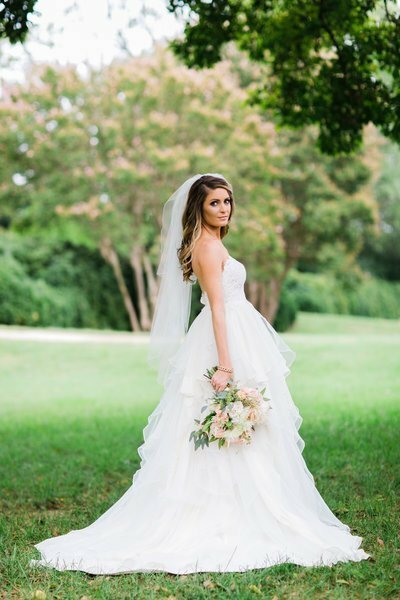 I love those bridal shots, I have no idea how you got her dress to billow so perfectly. I guess that’s why you are the professional!